"Custard pie is brightened with crushed pineapple in this fun and easy pie. 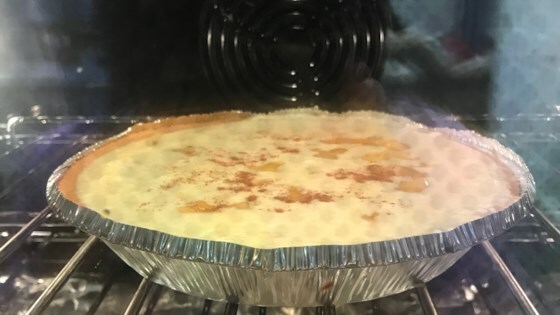 When I was little, my best-friends great-aunt Tootie would make this pie for the family each and every summer at her home in Iowa and it became a favorite of my family too!" Stir together 1/3 cup of sugar and cornstarch in a small saucepan. Stir in the crushed pineapple with the juice, then bring to a simmer over medium heat. Cook and stir until the mixture has thickened and turned clear. Remove from the heat and allow to cool. While the pineapple mixture is cooling, place the milk, vanilla extract, cream cheese, 1/2 cup sugar, and salt into a blender. Pulse until the mixture is combined, then add an egg and pulse until smooth. Add the remaining egg, and pulse again until the mixture is smooth. Pour into the pie shell and smooth the top. Carefully pour the pineapple mixture over the pie until evenly covered, then sprinkle with a pinch of nutmeg. Bake in the preheated oven for 10 minutes, then reduce the heat to 325 degrees F (165 degrees C), and continue baking until a knife inserted into the center comes out clean, about 40 minutes more. Cool to room temperature, then refrigerate for several hours before serving cold. Make the classic All-American pie—and watch tips for picking the perfect apple. This pie is VERY good! I didn't use a blender, just a beater to make the custard mixture fluffy, and followed the advice to put the pineapple filling on the bottom. Yum!